Are you tired of being strapped to “the man”? Are you striving to live a simpler lifestyle? If so, homesteading is for you. When most people think of homesteading they think of chopping their own wood, raising their own food, and being self-sufficient in as many ways as possible. In all actuality, homesteading has many different levels. So if you already have a few acres of land, great! If not, don’t fret…you can start right where you are and here are all of the things you need to know before starting a homestead. 1. How Self-Sufficient Do You Want to be? This is the most important aspect to consider before launching your homestead. Some people just want to grow their own vegetables. Others want to raise their own animals. Some take it even further and want to live totally off the grid. It is important to have a goal in mind before getting started so you can create a more accurate plan. If after you achieve the goals set and decide you want to take it a step further, go for it! However, having that initial goal is so important for motivation in the beginning. 2. Gardening: How do I Make This Plant Grow? If you are starting a homestead, you need to know how to start something from a seed and make it produce. It is all about how to produce healthy plants that can feed you and/or your family with as little dependence upon the outside world as possible. You’ll need to do lots of research to decide which methods you would like to try. For instance, you can choose to till your garden or do the no-till method where you pile your compost and woodchips on top of the soil and let it compost. You can choose to use pesticides or go completely organic. It is your homestead so you have the freedom to decide what works best for you. Most people go into the lifestyle of homesteading because they want to know that they can survive regardless of their circumstances. Whether you are concerned about a time that there will be no grocery store available or tough financial times, being able to grow and then preserve (i.e. can) your own food are some of the most essential parts to homesteading. It is important to learn how to process your food safely. You will also need to know what materials you will need in order to preserve your food so that way you can begin stocking up on them. When canning your food you will need lots of Mason jars. You will also need lids and rings to seal the jars. A pressure canner is an essential part of canning so that way you have the option of pressure canning or water bathing in order to preserve. Then there is a matter of finding and perfecting the best recipes to save your food in the tastiest way possible. It is important to understand you can homestead on a full fledged farm with acres and acres or something as small as a half-acre or less. You will need to go back to step one and assess how far you want to go to determine how much land you think you will need. If you want a milk cow obviously you will require more land. If you think you just want a garden and some chickens, you can get away with having less land. The most important thing to understand when searching for land is that everything must have its place. When looking at land, map it out and see if everything will fit. 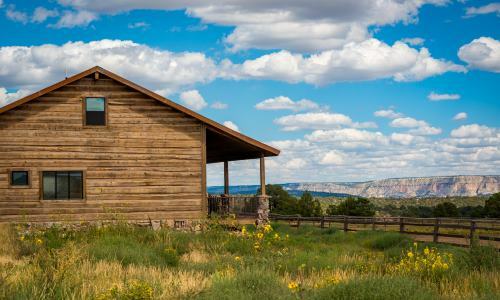 You will be surprised at how little land homesteading can actually take. You can also research and find that there are still some areas that give away free land. When searching for land, it is also a good time to decide what type of home you want to go along with the land. Some people are choosing to build inexpensive tiny houses, others buy old mobile homes or RVs and fix them up, and some choose to place their dream house on their dream land. The main thing is to map everything out to be sure you can fit all that you want in that space and leave yourself with a little room to grow. Don’t let this tip discourage you. When homesteading, it is important to develop carpentry skills, but you don’t have to be an expert. You will soon learn that functional homesteads are not always pretty, and they don’t have to be. However, if you know how to build things you will save yourself a lot of money. You will be able to upcycle many items as well. Carpentry is what will give your homestead character. A lot of homesteaders choose to raise livestock. This can range from a cow to goats, chickens, ducks, rabbits, pigs, honeybees, and so much more. Research all that homesteaders actually raise. You will be surprised! Then it is important to learn all about keeping as many animals as you fancy. It is trial and error when keeping animals, but the more knowledge you have beforehand the less painful the learning curve will be. For instance, many people don’t know that you can raise chickens and get eggs without a rooster. This is important to know because if you just want to raise chickens for eggs then you won’t have to worry about buying a rooster. However, if you want to raise chickens to hatch then you will need to make the investment and buy a rooster. Homesteading is all about utilizing EVERYTHING! You will be amazed at how much you currently waste once you begin this journey. Scraps are now compost that can be fed to the animals or used for dirt. Chicken and rabbit droppings are now fertilizer. Ashes from the fireplace are now thrown out on the garden to enrich the soil for better growing in the spring. I can’t stress enough the importance of researching through the internet. You will find all kinds of amazing ideas that people have used to upcycle items that are able to meet a legitimate need for little or no cost to them. You will need very little equipment to get started homesteading. You will need the basics like hammer and nails. As time goes on you may consider investing in an old tractor, tiller, and other tools that might make your life easier. However, I don’t recommend purchasing a lot before you get started because your plans will change. You will make many mistakes and learn what works. With that being said, you will find that you will need different things. So make sure you have the basics in order to build with but not much more. Do start stocking up on pallets. You can find them for free at many businesses. They are magnificent, cheap items that can be used to build fences, make gates, buildings, walkways, and a lot more. They are usually very sturdy and a great thing to have on hand when you need to build something and don’t want to waste money on different materials. Homesteading is an investment. However, do not let the financial side of things stress you out. Many people think that they have to have all of this money upfront in order to start a homestead. That is incorrect so please don’t go take out a massive loan to fund your journey. Homesteading is about simplicity so don’t complicate it. Yes, it will take some money to develop your homestead but take it a project at a time. Homesteading takes time so even if you wanted to fund it all upfront, good luck getting it all done that fast. Develop a plan (see step 1) and take it one step at a time. This is a lifestyle so it will take patience and ingenuity, but you will be amazed at the homestead you can create for very little money. The last thing you will need to know before launching your homestead is to adjust your attitude. When you decide to homestead your priorities have to change. Your mindset turns from the “finer things in life” and starts looking at the simpler things in life. It is no longer about keeping up with your neighbors but about doing more with a lot less. This is how you gain knowledge and learn how to survive without being dependent upon all of the things modern day society has become dependent upon. Homesteading is an art and it takes time to learn how to do it all, but you can do it! It is an amazing journey to freedom and knowledge. Now that you know what to consider before launching a homestead, what excites you most about taking this new journey?